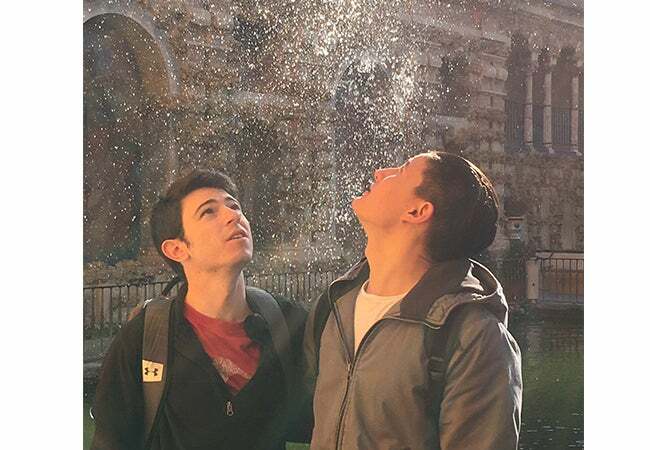 The purpose of my Stern Voices from Abroad blog is to provide aspiring study abroad students a personal and exploratory perspective of being in Madrid (and Europe as a whole) rather than just a description of basic NYU Madrid subjects such as academics and place of residence. In Madrid, I am staying in the Claraval residence hall and taking Spanish I, Foundations of Finance, Management and Organizations, and Political Urbanization, but a lot of this type of information information can be found on NYU’s study abroad website. My first month abroad mainly involved exploring the country of Spain as a whole. 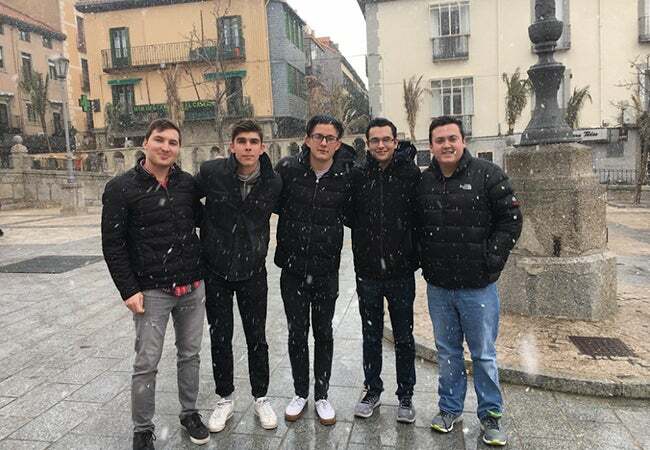 NYU Madrid organizes day trips for all study abroad students to go to Segovia and El Escorial as well as an overnight trip of your choice to either Córdoba, Bilbao, Salamanca, or Barcelona (I chose Córdoba). Later on this semester in April, we will also be visiting Toledo. Our first day trip to Segovia was a great starter trip, given the fact that most of us hadn’t even been in Spain for a complete week yet. Although the city was only an hour away, there was a significant change in both the elevation and weather, going from the brisk, cloudy weather in Madrid, to complete snow in Segovia. In Segovia, we were grouped in either English or Spanish-speaking tours to see the city and its famous historical landmarks (such as the Aqueduct and Alcázar), followed by a 2-hour roaming period for lunch before heading back to Madrid. El Escorial followed a very similar format and was also around an hour away. My third trip through NYU was an overnight trip to Córdoba, which is roughly a five-hour drive away, located in southern Spain. In Córdoba, we saw the Mosque-Cathedral of Córdoba, which is commonly regarded as one of the most accomplished Moorish architectural monuments. On top of that, we also toured the city in our respective English/Spanish groups and on our own during our free hours. I definitely felt all three NYU trips were extremely informative and immersive in learning about Spain’s history and culture and were well worth going (it’s free by the way!). However, my favorite trip so far was when my friends and I went on a day trip to Seville. For only 51 euros, we booked a round-trip Saturday flight to southern Spain (the city is actually near Córdoba) for an action-packed 10 hours. Seville is one of the most beautiful cities I’ve seen in Europe, with a way of life that seems much different from even the other large cities in Spain. With numerous palm trees and a cloudless sky, the atmosphere was a nice contrast to Madrid. Meanwhile, there was also the beautiful architecture, vivid design, and warm energy that made Seville feel so unique. My local experience in Madrid has also been quite spectacular thus far. It has involved a lot of soccer. I have been to multiple games/stadiums and have played soccer with other NYU students and Madrid locals at the Parque de Santander, which is around a 20-minute walk from the Claraval residence hall. 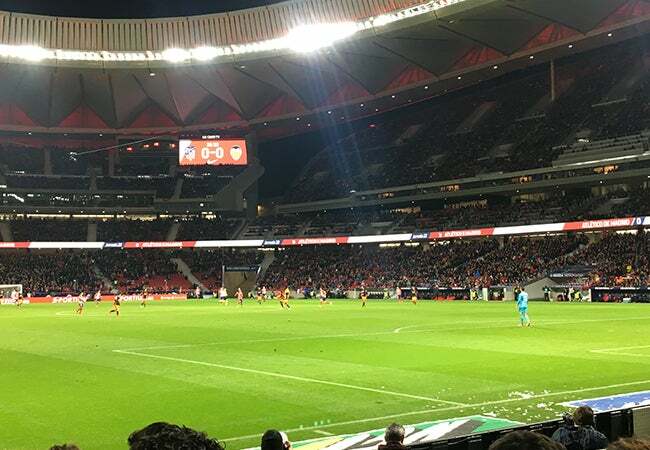 The two soccer games I have been to were a second division Rayo Vallecano game, where we got to watch local die-hard fans see their team win 5-1, as well as a La Liga first division Atlético Madrid vs Valencia game held at the brand new Wanda Metropolitano Stadium. Sitting in row five, we were able to get a close glimpse of several world class players including Antoine Griezmann, Diego Costa, and Jan Oblak. Whether you are a fan of soccer or not, I highly suggest a visit to the Real Madrid Santiago Bernabéu Stadium (which you actually walk by on the way to class every day if you are coming from Claraval). Although I have not yet been to a Real Madrid match, my friends and I did go on a tour of the entire stadium. 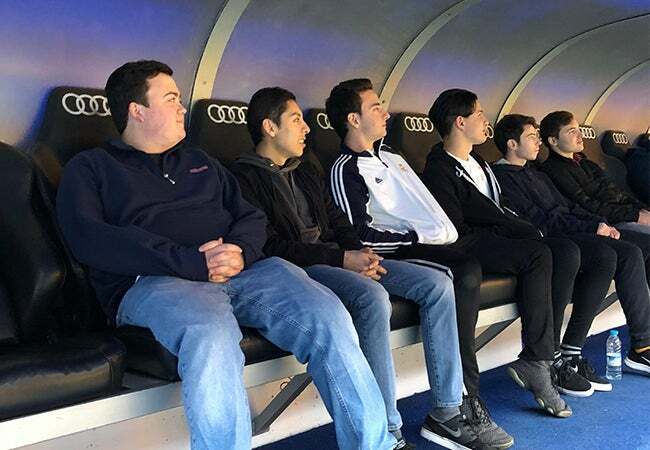 The all-encompassing tour included a top-down view from the inside, a walk through the trophy room showing decades of highlights of Real Madrid’s most important games and players, access to the Real Madrid locker room, and a run-up to the actual pitch. In addition to providing aspiring studying away students details and my perspective of studying abroad at NYU Madrid, I also wanted to take a brief moment to let you all know that there are several study abroad scholarships available for U.S. college students who want to spend a term abroad, no matter what location you choose. For example, the Gilman Scholarship is an amazing one to look into. Thousands of Gilman Recipients/ Scholars from across the country earn up to $3000-$5000 for their term abroad, as well as an additional $3000 if they are studying what Gilman considers a “Critical Need Language.” More information on the Gilman Scholarship can be found on their website. Additionally, information on other study abroad scholarships can be found on NYU’s website. Check in next time for more about the local life in Madrid and adventures around Europe!